Our pricing is for teams and not per user. 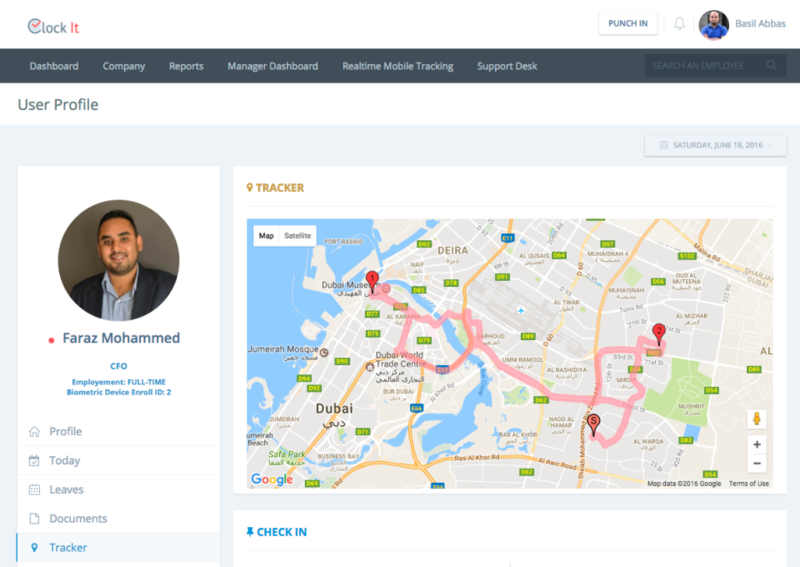 Cloud based time, attendance and GPS tracking software. Monitor just one or multiple business locations. With ClockIt you can access your dashboard from our mobile apps or the web browser . 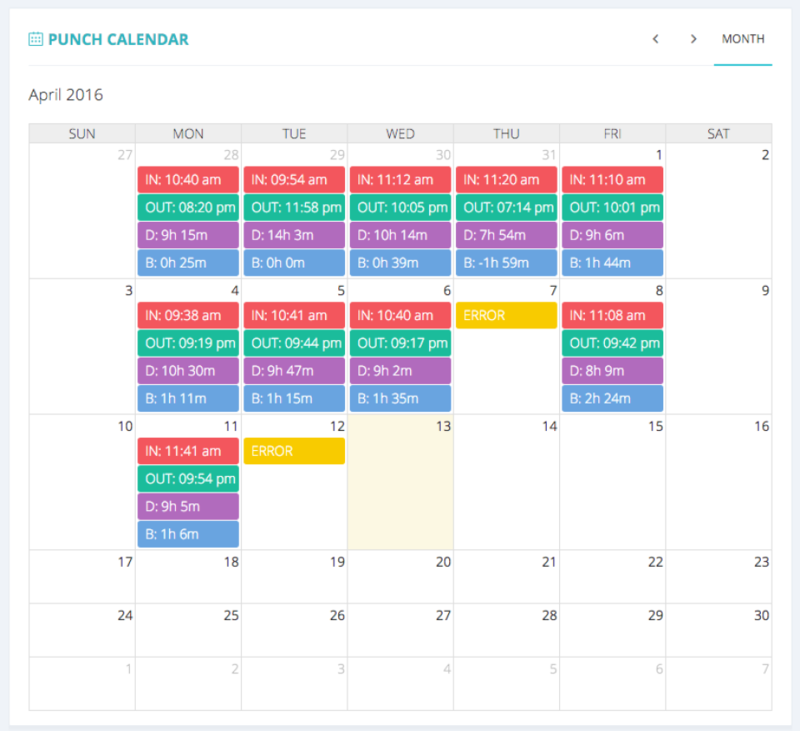 ClockIt helps you manage leaves, holidays, routes plans, employee GPS tracking and many more features. Have a look at our demo for more details. Contact support at any time and we are happy to help. Pros: Customization. Great Customer support. Fast payroll (once you figure out how to use the filters and save preferences, its a breeze). It took me awhile to get the promised "5 minute payroll", but their customer support helped me work through some issues and bugs and now it is runner very smoothly. I suggest reading their articles on how to use the features and then if you cant find what you need there, hop on the chat and talk to the support staff, he is very helpful and usually understands the problem. I asked for an improvement on the dynamic report and they worked to implement my idea. That gave me a lot of faith in the company. Cons: We still have some issues with mobile clockins. Some users get a lot of errors, however, i think this could be issues with their devices as several other users do not have issues at all. There have been a few bugs, however, such as geo-fencing errors. I hope to move to bio-metric clockins to avoid these issues. The program is not super user friendly if you don't understand computers. Its not impossibly so, but if you don't have patience and a willingness to work through it, this program can be frustrating. So its not for everyone, but i would recommend it highly. Can you tell us the one part that you feel like is very complex? We would love to improve on this. Pros: brilliant interface, flexible platform, great in attendance management, easy to use, perfect permissions control. Cons: this was designed for small companies, Very weak electronic forms, No forms auto fill, other apps are much more established in documenting the HR Records, No electronic Signatures, No flexibility in calculating the Leaves as per companies needs (example: no possibilities for calendar days leave calculation, only working days). No multi layers reporting (only one manager), No multiple approvals available (only the reported manager can approve). the approvals are not properly reflected with signatures on the final created form. My experience in clockit was amazing because it helps us a lot with team's attendance management! Pros: What I like the most with Clockit is its integration features with other apps such as Slack. Also, Clockit has a very responsive customer support which helps us resolve issues right away! Cons: As for now, Clockit does not have any features that we do not like. 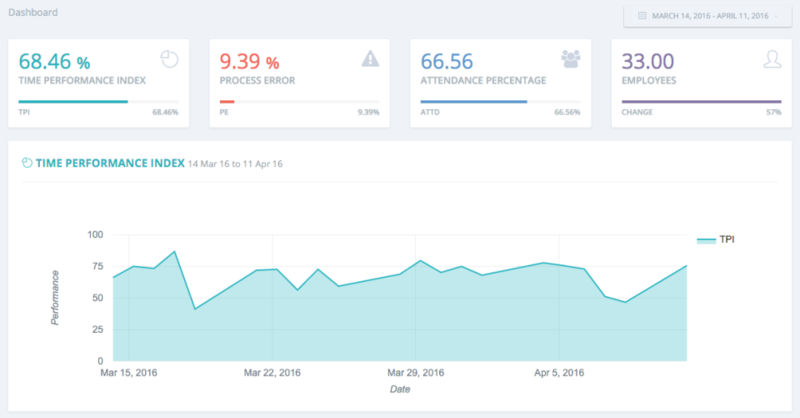 We really are satisfied with this attendance management platform. For suggestion, develop more awesome features! We have an awesome feature for you. Exactly what we were looking for for our small business! Pros: It is very easy to use! It makes tracking employee hours very user friendly and accurate. We used self reporting and our employees were shorting themselves on hours! Cons: The Dynamic Reports don't default to Monday-Friday and there's no way to change the date structure from D/M/Y to M/D/Y which means I have to go in after I've exported the report to Excel and change those by hand. 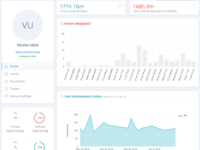 Overall: Increased accuracy in tracking employee hours. Thank you such a great review. We also have a new reporting format around the corner that we think you are going to love!! It has been a good one so far. Pros: I like that the software integrates with Slack very well and it gives me daily reports on the employeers. Cons: I don't like the fact that it is so dependable from slack or even its own website to punch in or punch out. If it had an app or something it would be much easier. We have 5 ways in which you can register a punch. Web, Mobile, Kiosk, Slack and Biometric. Let me know if you need help with this. Would be happy to have a call with you. Pros: The interface is attractive and easy to learn. We needed a good option for an online clock-in system for our small office, and this is by far the best. Cons: The time correction request system is a little clunky. It is difficult to understand, and as an administrator it doesn't seem to be possible to submit a correction for an employee without him/her requesting it first. Overall: When we started as a small office, we needed a simple solution to keep track of employee time. ClockIt has made employee time keeping easy, and has helped the payroll process immensely. We are small enough to use this as a free product. If we had to pay, we wouldn't. Pros: The cost. We only have three employees, so we do not have to pay. If we did, we would find another service. Cons: It is difficult to use. Far too much information for what we need. If I need to correct a punch, or make a future punch, I have to jump through multiple hoops. Export info at the end of a pay period takes far longer than it needs to. It's possible I am not doing it correctly, but tutorials given to me by customer reps weren't helpful. Pros: It is simple and user friendly. I like the layout. The fact that buttons all connect to one another is great, you can access everything just by clicking here then there. I llike the fact that the dynamic report has so m any different options. I also like the fact that employees can easily submit a request. I think it is great! Cons: There are no options of printing reports easily, I want to print for all employees their hours and there is no way to do it. I can get really frustrating. I would also prefer if there was a way to make corrections a day. This feedback is awesome for us. We have a new reporting format being released in a few days that will allow you to easily print the reports. Correction requests overhaul is what is being developed now and is up for the next release. Thank you for your feedback. 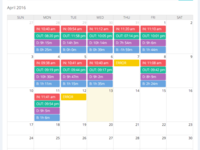 We are planning updates to the scheduler and this will be released in the coming weeks. Pros: I like that I can set the clockin to only be used with the IP address I set. And that my users can request time off . Cons: Its a little confusing with setting up different users and time templates. The date set up is D/M/YEAR. And I'm use to M/D/Y so whenever I set up a new user I mess that part up. Pros: The software has a great report feature. It is easy to run and to get only the data that I need. The price can't be beat, free for up to 3 users! Cons: Editing punches is a little bit tricky and requires multiple steps to figure out. Once you do get it figured out it ain't too bad.The mobile app could use some improvement. 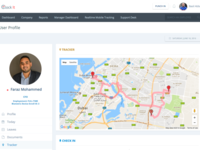 Pros: GPS tracking and time attendance all included in one tool. Overall: We use this tool for our small team that is always out of office. Thier GPS tracking apps along with time and attendance ensures that I can monitor them even when I am not in office. Pros: It's very inexpensive and easy to set up for a small business. Cons: Some of the reports have weird setups and customer service can be hard to get a hold of. Overall: I use ClockIt to schedule employees in a small jewelry store. We have, depending on the time of year, between 3 and 5 employees. It works great.. Sometimes the scheduling page can be a little janky if the week spans 2 months, but all in all it works great. Great support and exceptional product. Pros: Their support is outstanding product does come out with regular updates. Their team is always ready to help. Cons: None so far. We are waiting for some of the features that we requested for. The ClcokIt team is currently developing these for us. Overall: Easy and effective time clock solution. Thank you for being such an awesome customer. Pros: Very easy to use we have a few employees and none of them have any trouble clocking in and our using the app. The Geo-fencing feature is especially useful. Cons: No integration with Gusto we love ClockIt, but may be switching to another service soon, since it does not have an integration with Gusto. Pros: Seamless integration of your existing biometric device. Cons: Configuration can be a little difficult, but online support was there to support until we had out account fully operational. Overall: ClockIt is the only software that was able to take care of all our needs. We wanted a solution that integrated into our current biometric device and ClockIt did exactly that. Best tool for sales and marketing teams! Pros: GPS tracking and real time mapping are a must have. Cons: Waiting to see the new features that they would release. 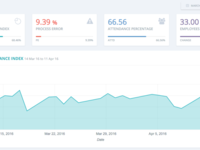 Overall: We used ClockIt to monitor our sales and marketing teams. Their Android ClockIt application made sure that we knew where our employees were at all times when they were checked in. The route map and real time status gave us the upper hand. Recommendations to other buyers: Must have for every organisation. Pros: Kiosk App provides a central locations for all employee's to clock in on one device. Individual log ins to the web portal allow employee's to check their own hours for accuracy and request any corrections if there are mistakes. Cons: The app allows you to double press the punch in/out button. Meaning you can accidentally clock in and out within a second so the app registers you as clocked out when you're actually working. You can only make one time correction for a day. If more corrections are required for that day, the initial correction needs to be deleted which also causes data loss. I started using clock it to manage my small team of employee's time sheets. Pros: I like that it the app is intuitive and connected to the site. It's very simple to use and the geotagging on punches helps mitigate time-theft. Cons: Some of the charts offer too much extraneous data. The back end could be streamlined or made a little more user-friendly. Thank you for your review. We will ensure that we try to make the experience even better!! Pros: Easy to use compared to software used in my previous company. Overall: With ClockIt finally I don't have to run to my manager for everything. My team and managers are fully updated and is as easy as a few clicks. Recommendations to other buyers: Initially difficult to understand to but once you start using it, it becomes simple. Pros: It has a free option for a team of 3, so it works well for us at the moment. It is fairly easy to use and customer service was very responsive when we needed help. Overall: We need to track hours and this software does it easy for us. Pros: I love that I can have employees clock-in information easily available online constantly for a great price (or free!!). Cons: I don't like how long it took me to figure it all out or the format in which I get the hours. I still ahve to do my own calculations and that's a pain. Overall: I like that I can monitor my employees' hours whenever I want. I like that the software is low-cost and the customer service is top-notch. Comments: We have an open culture in office. With this, it makes it difficult to monitor when people come and go. With ClockIt my team and I could plan ahead and make sure we were as productive as possible while were in office. Thank you for this review. BTW display attributes can be saved as a segment :-) This is a feature we have had since day one. Give it a shot. Pros: Dashboards were excellent but must say the Customer Service provided by Basil was the best. Pros: The ease of punching in and out. Also the affordability of the program for the available benefits was great. Cons: The correction process. You could only do one per day and it would override anything that was in there previously. Also the reporting could be a little cleaner. Pros: it is easy to review my workers' hours, easy for everyone to punch in and out and make corrections as needed. Cons: i still need to figure out how to print up monthly report of everyone's hours to send to payroll. some of the users do not have enough room to download app on their phones. You asked and we had to do something about this. Check out our new reporting engine. Cons: Offline functionality isn't possible. Some of our sites have poor internet connection hence at times we are forced to revert to manual means; Also, is it possible for register of finger prints through the kiosk app for android? Simple to use. Easy to understand. Pros: It is very specific and reports are easy to run. The interface is also simple to understand. They perform updates often, which is a sign to me that they are trying to improve. Cons: Clock-in and out takes longer for the no-so-computer-savvy. I wish that there were more custom reports. Pros: It looked like a great program until I spoke with the owner. Cons: The prices on their website are apparently wrong and they don't change them or honor but make you pay a higher amount. Overall: I did a trial for our business and spoke on the phone with CSR (who was late) and when I inquired on a few features I was interested in he fumbled around and said those weren't options and the prices on the website that have been up for several years have been wrong the whole time and also haven't been updated even after I brought this up. His lack of customer attention and concern was ridiculous and didn't seem like he wanted any business so ClockIt gets a piss poor review for wasting my time. Thank your for such a detailed review. The CSR that you spoke to was me (Basil) and I am the founder of the company. You might have seen our pricing from someone who has reviewed our product earlier! I am sorry we don't have a FREE tier for you. If you can point me to any one page on the ClockIt website that shows a different pricing I will consider your review legit and take it seriously. Pros: Its customizable and easy to use. More over I love the customer support. They respond very fast. And helpfull. Cons: Still there are more ways to improve and need more customization. Adding time custom have to do for each user individually. We prefer to do at once. If we have 100 employees how will we do one by one? Biggest draw back. Software is fine and accomplishes what I need it to but it's not as simple to use as I wish. Pros: I love that there is a free version for our small company of two employees and that I can use it at the free level until we need to grow to include more employees. I like that it is very simple for my employees to clock in and out each day on their phones. Cons: I find it very confusing to accomplish tasks that should be quite simple. All I need is the total number of hours each employee worked to paste into Quickbooks but it takes way too many steps to manually run that report, select dates, and sift through lots of unnecessary data. I also find it very user-unfriendly to correct employee errors and missed punches which I have to do somewhat regularly. I'd love to have an automated report appear in my inbox each week with JUST the information I need and nothing more. Thank you! Cons: The GPS would not always work and so it made questions about the integrity of the program as a hole. Also there were times the guys forgot to check in so when the GPS did not work, we had no reliability to challenge them. We use this for a few hourly employees we have. It's working great for what we have. Pros: The ability to easily make corrections on time, track hours, etc makes it easy to quickly get in and track hours. Cons: There's a lot of functions we don't need and can look confusing. IF you could opt in for a simpler version without so many default templates, that would work perfect for a smaller company, like us. Pros: Internal correction requests. Manager approval, separate teams. User interface is really nice. Mobile app needs some additional features, like correction request, leave request. Cons: Correction requests needs to be changed, now too much data is sent for approving. businesses trips is calculated strangely. I really like the support! Pros: Customer Support, Reports, plan the vacations, easy to use. Cons: The app doesn't work. Overall: I was using another app to register my working hours, but Basil is always helpful, so I've changed to ClockIt! And here I can find all I need to manage my small team. Recommendations to other buyers: Just use it! We hope the new app update was able to solve your problem. Comments: Our company adopted ClockIt last month and it is a fantastic product. It not only saved us the mundane, manual effort of collecting & analyzing our employee in / out times and drawing insights for them for process correction, but even our employees began to spend their stipulated time at the office. Our overall productivity grew a significant amount since we installed ClockIt. 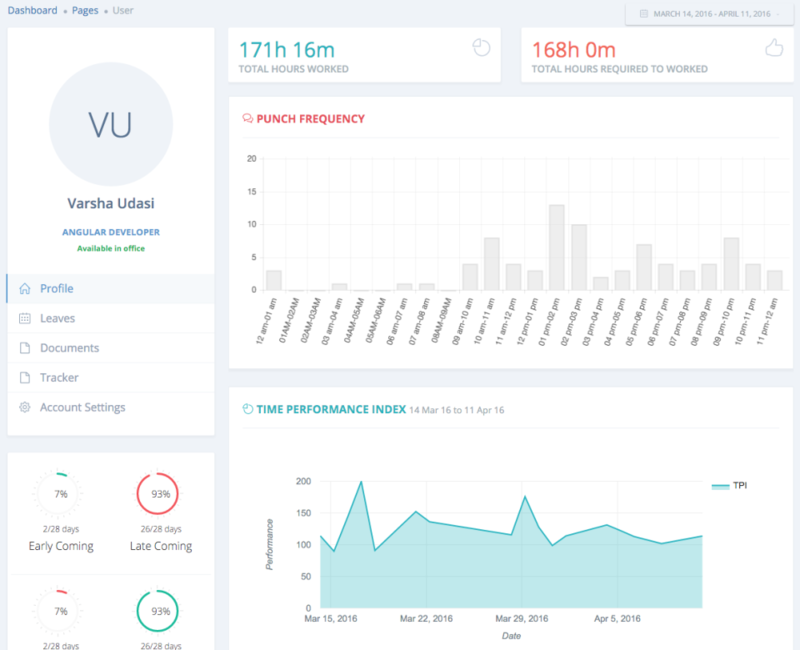 ClockIt's dashboard is fantastic and extremely informative at all levels - Org, Team and Individual dashboards. Highly recommend this. We are a technology services company and so cannot ignore the fact that time is money! Thanks to ClockIt, we now have more time, and hence more money. Sometimes easy, sometimes hard. Especially in the matter of gps tracking. Pros: There are so many itemized features. Can be used for 1 company with numbers of region. 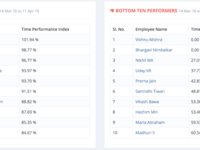 Managers can get detailed customized reports on staff performance. Cons: You really need to constantly clean your cache when it gets high. Otherwise your Puch will be failed. Overall: Digitalization of staff attendance & performance report. Great program. A little too busy if you just need a basic punch clock. Pros: I like the punch clock and the ability to submit punch correction requests. Also love the ability to restrict punches to IP addresses and geo fences. Cons: All of the statistics are confusing and in my way. I wish there was a way to have them not appear on a user profile. Pros: It is the best system I ever use. I like customer service, none of the other systems is better than Clockit. Cons: So far, I have not seen any con yet. Every time you are doubt with something. You can just contact customer service right away. Always a pleasure to serve customers. Pros: Daily report on each employee time contribution. Tracking of my field and sales staff. Overall: This product has helped me shave hours off micro managing the workforce. Analysing the performance of my employees for payroll and appraisal is made simple. Thanks for the appreciation. Do look out for all the new features that we have planned. Pros: Easy to use all features that are well documented. Cons: Some features can be missing, but they are quick to develop them. Overall: Make the whole process of reporting and time and attendance very easy. I can easily manage my team and also report to my manager. Thanks Nihal for your review. Pros: It is really easy to use. Good graphics. Not so good reports. Cons: Not customizable. I would like to know who check in late and who check out early. Pros: Robust reporting and customization requests are honored. Cons: Has a slight learning curve. Overall: Provided everything we wanted from a time and attendance solution. Reporting was their standout feature. Recommendations to other buyers: Once you are used to the tool, it becomes very easy to use. Pros: Easy on and off. Suggestion, can you make the clock round up and down, ie, 10:02 would be 10:00 ...10:03 would be 10:05 and so on? Lets see how we can accommodate this request. Comments: We implemented ClockIt about a week back. I had to come back and write this review because ClockIt improved out work life balance within a week. ClockIt send out emails to employees and me as an admin. With this employees could plan their time and a business owner I knew everyone was working well together as a team. ClockIt also helped me identify those employees who were really putting in additional time. I never had access to this information with so much ease earlier. Pros: I like that it doesn't force me to use another CRM. I just needed a clock in out option and this is perfect. Cons: no negatives I've experienced. At first it was difficult to see a quick view of hours worked in a week or month. If I had one suggestion, it would be to make it more readily available to pull that quick report on hours logged by the team. It might be there, but I can't find it. Comments: Our company implemented ClockIt a few months back. I can tell you that this has made me a superstar as my managers now appreciate me for the efforts that I put in. Previously there was no way for anyone to know!